I'm asking $4000 (or best offer) for a new home-built body on minimally used 2010 titled trailer. I am the only owner. Designed to be lightweight for fuel economy. I has 1/2 fir sidewalls with 2-layered 10mm sheets of coroplast (staggered cells) for the top part of side walls. At 750LBS (have weight ticket), it can be towed by a sedan. Includes brand new A/C, outdoor kitchen w/3 large storage compartments that can be zipped and detatched, 6 windows, 2 doors (front door is a dutch door), 2 interior lights, hatch, removable & adjustable galley counter, wine glass rack storage baskets, metal rack rods for adjustable shelves and a desk top, detachable side storage, swing rolling Jack on neck. Protective material on undercarriage. Maximum interior height, 6'2". Hitch receives a 1 7/8" ball. Exterior mural pays homage to the teardrop camper. 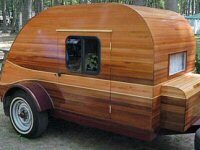 The design allow this unit to be used as an utility trailer with a few adjustments. it also allows for variety in sleeping configuration. The pics show a queen size air mattress with the head at the front door. However, the galley counter could be placed on the upper supports and the head of the bed could be at the rear...or a cot could be used instead of an air mattress. If you would like to discuss an offer, contact me at br549YES@gmail.com . All sincere offers will be considered. Last edited by Todah Tear on Tue Feb 05, 2019 11:19 am, edited 6 times in total.